Bowls of pasta, abundant seafood, roasted vegetables, bread dipped into olive oil, and even a glass of winethe Mediterranean diet is easy to follow because its also a lifestyle. 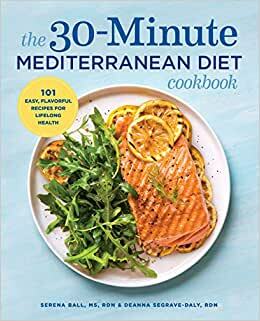 The 30-Minute Mediterranean Diet Cookbook makes it easier than ever to get your fill of the Mediterranean diet and all of its health benefits with quick, satisfying recipes for health and longevity. Start reading The 30-Minute Mediterranean Diet Cookbook on your Kindle in under a minute. Serena Ball, MS, RDN, and Deanna Segrave-Daly, RDN, have over 20 years of food, nutrition, and culinary communications experience, and they've dedicated their careers to helping people get delicious and nutritious meals on the table. Together, they co-own Teaspoon Communications, LLC, and blog at TeaspoonOfSpice.com, where their motto is "Two dietitians who love food as much as you do." This is their first cookbook. This is an easy, flavourful, fabulous cookbook. Other reviewers have referenced the many health benefits. It includes an easy to understand overview of the Mediterranean diet and basic principles of the diet and lifestyle. It also provides a helpful list of foods and equipment to stock in your kitchen and pantry so that you can easily cook this way. There are 101 recipes for breakfast, snacks, soups and salads, main dishes and desserts. Each recipe is clear and easy to follow and true to the name of the book - taking 30 minutes or less to make. The Roasted Shrimp Gnocchi Bake was my stand out favourite and I have cooked it many times. If you are interested in incorporating delicious, flavourful and healthy meals I encourage you to purchase this cookbook. 5.0 out of 5 starsMany delicious recipes! I am a physician, and I often recommend a Mediterranean diet to my patients for reducing cholesterol, losing weight, managing diabetes, and reducing cancer risk. This book gives me an easy resource to suggest to my patients who want ideas on delicious, quick and healthy recipes. I loved the honey-rosemary almonds as a delicious snack (by themselves or with a cocktail), pastina chicken soup with kale for warming comfort food on a chilly night, roasted broccoli panzanella salad as a hearty, satisfying yet healthy starter, and roasted red pepper chicken with hummus for a seemingly fancy yet easy and delicious dinner. There are lots of vegetarian and gluten free recipes, also delicious! 164 people found this helpful. 5.0 out of 5 starsQuick & Tasty Recipes with Health Benefits! As a Registered Dietitian Nutritionist, this is one of those cookbooks I've been waiting for my entire career of several decades! I can simply promote these recipes because they "taste good" and don't have to mention they're "good-for-you." They're created by two dietitians and taste-tested by colleagues, and most importantly, their kids and husbands had to like them! Several of the recipes are standard favorites, but with a "twist." For example, the beef sliders include chopped mushrooms for a juicy burger with added veggie benefits. The pasta for the Pasta Fagioli Soup (photo with the soup ladle) is cooked directly in the soup pot for a quick one-pot meal. The hummus (photo with carrot and celery sticks) is made with budget-friendly peanut butter rather than the more expensive tahini (sesame paste) and contains just 5 ingredients. The "Marinara Eggs" (skillet with 3 eggs) are cooked directly in a pan of Italian diced tomatoes ... delicious and so easy to make ... my husband and I are likely to prepare this most often for a quick dinner meal. Other recipes offer new recipe flavors and techniques such as "Pomegranate Cherry Smoothie Bowl. All of the recipes are made with a short list of ingredients. -- Ingredient substitutions and alternatives are offered. -- Both quantities and approximate amounts of ingredients are given; for example, "2 garlic cloves, minced (about 1 teaspoon)". -- Times, temperatures and size of preparation bowls and cooking pans are given throughout. -- You don't have to guess whether or not to cover a pan or skillet when you cook a recipe. -- There recipes are appropriate or can be adapted for a variety of dietary needs such as vegetarian, vegan, gluten-free, etc. -- Though most recipes will make four servings, it is easy to make more or less of several of the recipes. Many, such as the soups, will taste even better the next day. -- It is easy to swap out ingredients for many recipes ... if you don't have one type of bean, use another. Missing walnuts ... try another nut. 5.0 out of 5 starsGreat value, and great gift idea! I can’t stop trying things from this book! The recipes are easy and very adaptable for special dietary needs and tastes. One thing I love is that because the recipes are uncomplicated, making a recipe the second time can almost be done from memory which saves even more time. Lastly, I personally hate the word diet. Don’t think that you are buying a diet book if you buy this one-it’s just a healthy way to eat, which is what we should be doing everyday anyway! I’m writing this review, coincidentally, late in the evening after having a delicious Middle Eastern supper in Minneapolis, Minnesota. Although I spent 15 years living in Mediterranean countries of North Africa, there weren’t a lot of dishes here that reminded me of the great meals I grew accustomed to. Yet, the salads and soups and sandwiches, looked terrific. Two were the chick pea patties (felafel, or tamamaya, is one of my favorite Middle Eastern foods). My wife makes great salads similar to the Greek salad described. Other nice features: Serving sizes; prep time; cook time and nutritional information. While there are some nice photographs of the completed dish, I would have prefered many more. The authors of this cookbook do a wonderful job at showing us how simple it is to incorporate a Mediterranean lifestyle into our daily lives. They include an easy to understand overview of the Mediterranean diet and basic principles of the diet and lifestyle. They also provide a helpful list of foods and equipment to stock in your kitchen and pantry so that you can easily cook this way. There are 101 recipes for breakfast, snacks, soups and salads, main dishes and desserts. Each recipe is clear and easy to follow and true to the name of the book - taking 30 minutes or less to make. Also included with each recipe are ingredient tips or prep tips to make the preparation even easier. Most importantly the recipes are delicious! The Roasted Shrimp Gnocchi Bake and Honey Cherry Walnut Brownies were 2 of my favorites and I have many more marked to try. If you are interested in incorporating more delicious, flavorful meals that will help you live a healthier life, I encourage you to purchase this cookbook.